Each of Insight’s products is designed to convey complex information clearly, effectively, and concisely, particularly to nontechnical audiences. Our white papers, policy briefs, reports, and other publications are tailored to ensure research evidence informs public policy and program implementation. We aim to exceed client expectations with every product delivered. The middle school years represent an important time in children’s development. The knowledge, skills, and social interactions students gain in middle school have a lasting influence on student motivation and academic achievement in high school and beyond. Research indicates that student performance in mathematics in grade 8 predicts future mathematical achievement, and students who are poor readers are more likely to drop out before graduating high school. In 2015, Florida ranked 44th among states and the District of Columbia scoring at or above basic in mathematics and 33rd in reading on the eighth-grade National Assessment of Educational Progress (NAEP) assessment. In an effort to improve middle grades achievement in the state, the Florida Legislature funded a comprehensive study of six states nationally recognized as having high performance on the eighth-grade NAEP in reading and mathematics. 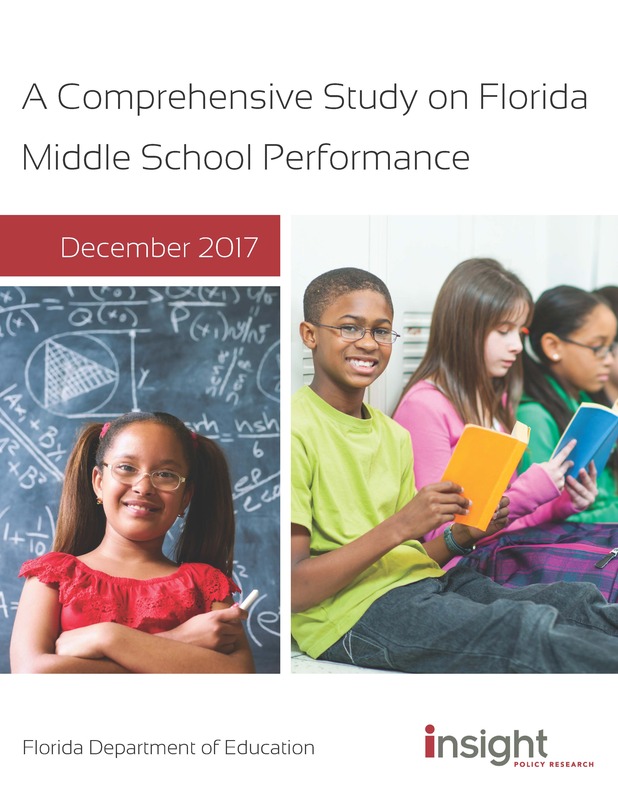 This report outlines findings from a comprehensive examination of middle grade performance, policies, and practices in Florida and the six states: Connecticut, Massachusetts, New Hampshire, New Jersey, Vermont, and Washington. 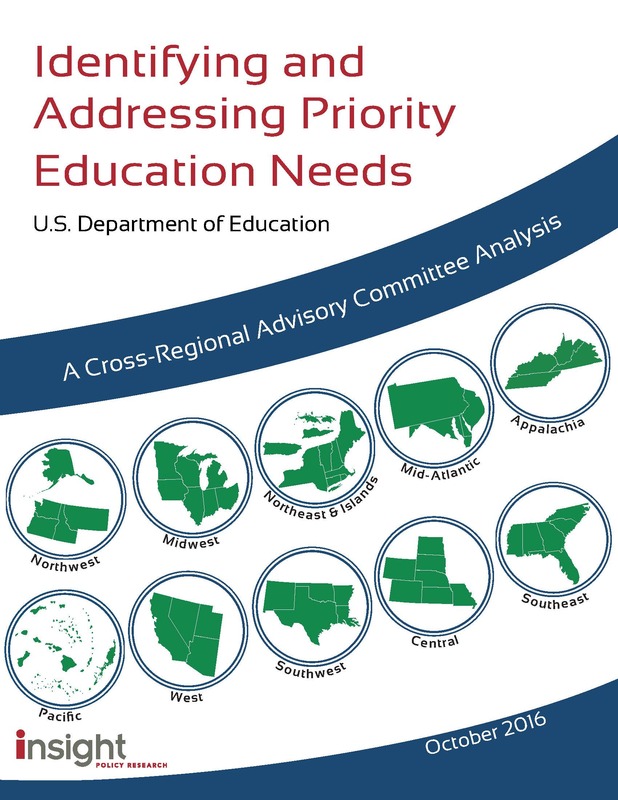 This report summarizes the activities and results of the ten 2016 Regional Advisory Committees (RACs), established under the Educational Technical Assistance Act of 2002 (20 U.S.C. § 9601 et seq.). The RACs were formed to identify each region’s most critical educational needs and develop recommendations for technical assistance to meet those needs. The technical assistance provided to state education agencies (SEAs) aims to build capacity for local education agencies (LEAs or districts) and schools, especially low-performing districts and schools; improve educational outcomes for all students; close achievement gaps; and improve the quality of instruction. Members of the committees were nominated by themselves or others and represented a variety of stakeholders, including the business community, LEAs and SEAs, institutions of higher education, and practicing educators. Ninety-three individuals were invited to participate in the RACs, of which 85 agreed to participate. Overall, 66 of these members submitted needs assessment reports. 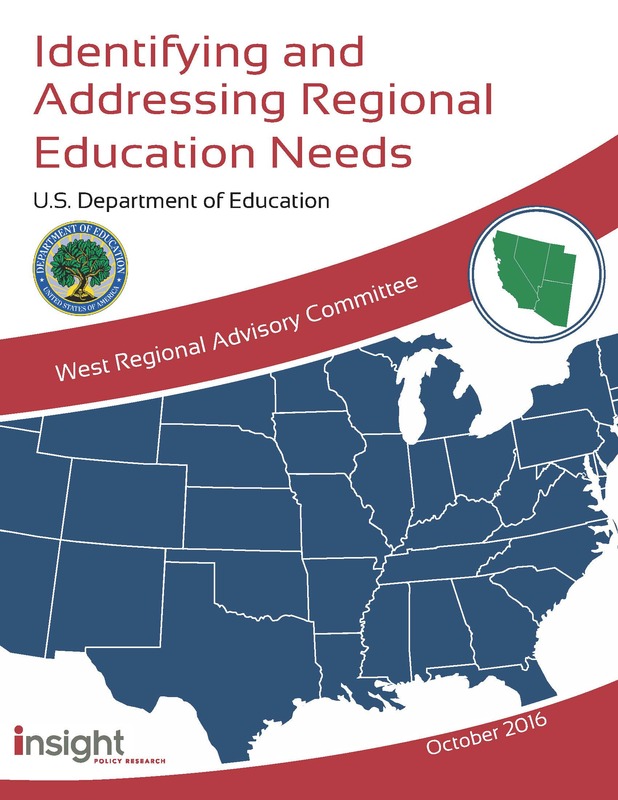 This report summarizes the activities and results of the West Regional Advisory Committee (RAC), 1 of 10 RACs established under the Educational Technical Assistance Act of 2002 (20 U.S.C. § 9601 et seq.). The RACs were formed to identify the region’s most critical educational needs and develop recommendations for technical assistance to meet those needs. The technical assistance provided to state education agencies (SEAs) aims to build capacity for supporting local education agencies (LEAs or districts) and schools, especially low-performing districts and schools; improving educational outcomes for all students; closing achievement gaps; and improving the quality of instruction. The report represents the work of the West RAC, which includes Arizona, California, Nevada, and Utah. Committee members convened three times and reached out to their respective constituencies between July 19, 2016, and August 31, 2016. Members of the West RAC represented a variety of stakeholders from LEAs, SEAs, businesses, regional service agencies, and higher education. The members collaborated, communicated, and shared resources using Communities360⁰, an interactive online platform hosted within the larger GRADS360⁰ system housed within the secure U.S. Department of Education environment. Table A provides a list of committee members and their affiliations. A stakeholder from Arizona and a stakeholder from California initially elected to participate on the RAC but withdrew from the committee during the course of the work in August. This report summarizes the activities and results of the Southwest Regional Advisory Committee (RAC), 1 of 10 RACs established under the Educational Technical Assistance Act of 2002 (20 U.S.C. § 9601 et seq.). The RACs were formed to identify the region’s most critical educational needs and develop recommendations for technical assistance to meet those needs. The technical assistance provided to state education agencies (SEAs) aims to build capacity for supporting local education agencies (LEAs or districts) and schools, especially low-performing districts and schools; improving educational outcomes for all students; closing achievement gaps; and improving the quality of instruction. The report represents the work of the Southwest RAC, which includes Arkansas, Louisiana, New Mexico, Oklahoma, and Texas. This report summarizes the activities and results of the Southeast Regional Advisory Committee (RAC), 1 of 10 RACs established under the Educational Technical Assistance Act of 2002 (20 U.S.C. § 9601 et seq.). The RACs were formed to identify the region’s most critical educational needs and develop recommendations for technical assistance to meet those needs. The technical assistance provided to state education agencies (SEAs) aims to build capacity for supporting local education agencies (LEAs or districts) and schools, especially low-performing districts and schools; improving educational outcomes for all students; closing achievement gaps; and improving the quality of instruction. The report represents the work of the Southeast RAC, which includes Alabama, Florida, Georgia, Mississippi, North Carolina, and South Carolina. Committee members convened three times and reached out to their respective constituencies between July 19, 2016, and August 18, 2016. Members of the Southeast RAC represented a variety of stakeholders, including LEA superintendents, teachers, and other school and district staff members; state chief school officers and other SEA staff members; and institutions of higher education administrators, professors, and researchers. The members shared resources, communicated, and collaborated using Communities360⁰, an interactive online platform hosted within the larger GRADS360⁰ system and housed within the secure U.S. Department of Education environment. Table A provides a list of committee members and their affiliations. An additional stakeholder from South Carolina (representing school boards, businesses, and parents) declined the invitation to participate in the Southeast RAC. This report summarizes the activities and results of the Pacific Regional Advisory Committee (RAC), 1 of 10 RACs established under the Educational Technical Assistance Act of 2002 (20 U.S.C. § 9601 et seq.). The RACs were formed to identify the region’s most critical educational needs and develop recommendations for technical assistance to meet those needs. The technical assistance provided to state education agencies (SEAs) aims to build capacity for supporting local education agencies (LEAs or districts) and schools, especially low-performing districts and schools; improving educational outcomes for all students; closing achievement gaps; and improving the quality of instruction. The Pacific RAC, represented in this report, includes American Samoa, the Commonwealth of the Northern Mariana Islands (CNMI), the Federated States of Micronesia (FSM), Guam, Hawaii, the Republic of the Marshall Islands, and the Republic of Palau. Committee members convened three times and reached out to their respective constituencies between July 19, 2016, and August 31, 2016. Members of the Pacific RAC represented a variety of stakeholders, including SEAs, institutions of higher education, and schools. The members collaborated, communicated, and shared resources using Communities360⁰, an interactive online platform hosted within the larger GRADS360⁰ system housed within the secure U.S. Department of Education environment. Table A shows the three Pacific committee members and their affiliations. Two representatives from FSM were invited to participate, but did not respond to the invitation. This report summarizes the activities and results of the Northwest Regional Advisory Committee (RAC), 1 of 10 RACs established under the Educational Technical Assistance Act of 2002 (20 U.S.C. § 9601 et seq.). The RACs were formed to identify the region’s most critical educational needs and develop recommendations for technical assistance to meet those needs. The technical assistance provided to state education agencies (SEAs) aims to build capacity for supporting local education agencies (LEAs or districts) and schools, especially low-performing districts and schools; improve educational outcomes for all students; close achievement gaps; and improve the quality of instruction. The report represents the work of the Northwest RAC, which includes Alaska, Idaho, Montana, Oregon, and Washington. Committee members convened three times and reached out to their respective constituencies between July 19, 2016, and August 31, 2016. Members of the Northwest RAC represented a variety of stakeholders, including the business community, LEAs and SEAs, institutions of higher education, and practicing educators. The members collaborated, communicated, and shared resources using Communities360⁰, an interactive online platform hosted within the larger GRADS360⁰ system housed within the secure U.S. Department of Education environment. Table A provides a list of committee members and their affiliations. A superintendent in Oregon and a representative from Office of the Superintendent of Instruction in Washington State were invited to participate in the Northwest RAC but declined the invitation. This report summarizes the activities and results of the Northeast and Islands Regional Advisory Committee (RAC), 1 of 10 RACs established under the Educational Technical Assistance Act of 2002 (20 U.S.C. § 9601 et seq.). The RACs were formed to identify the region’s most critical educational needs and develop recommendations for technical assistance to meet those needs. The technical assistance provided to state education agencies (SEAs) aims to build capacity for supporting local education agencies (LEAs or districts) and schools, especially low-performing districts and schools; improving educational outcomes for all students; closing achievement gaps; and improving the quality of instruction. The report represents the work of the Northeast and Islands RAC, which includes Connecticut, Maine, Massachusetts, New Hampshire, New York, Puerto Rico, Rhode Island, Vermont, and the U.S. Virgin Islands. Committee members convened three times and reached out to their respective constituencies between July 19, 2016, and August 31, 2016. Members of the Northeast and Islands RAC represented a variety of stakeholders, including LEAs and SEAs; institutions of higher education; parents; practicing educators; and organizations serving youths and educators. The members collaborated, communicated, and shared resources using Communities360⁰, an interactive online platform hosted within the larger GRADS360⁰ system housed within the secure U.S. Department of Education environment. Table A provides a list of committee members and their affiliations. This report summarizes the activities and results of the Midwest Regional Advisory Committee (RAC), 1 of 10 RACs established under the Educational Technical Assistance Act of 2002 (20 U.S.C. § 9601 et seq.). The RACs were formed to identify the region’s most critical educational needs and develop recommendations for technical assistance to meet those needs. The technical assistance provided to state education agencies (SEAs) aims to build capacity for supporting local education agencies (LEAs or districts) and schools, especially low-performing districts and schools; improving educational outcomes for all students; closing achievement gaps; and improving the quality of instruction. The report represents the work of the Midwest RAC, which includes Illinois, Indiana, Iowa, Michigan, Minnesota, Ohio, and Wisconsin. Committee members convened three times and reached out to their respective constituencies between July 19, 2016, and August 31, 2016. Members of the Midwest RAC represented a variety of stakeholders, including LEAs and SEAs; institutions of higher education; practicing educators; and organizations serving educators. The members collaborated, communicated, and shared resources using Communities360⁰, an interactive online platform hosted within the larger GRADS360⁰ system housed within the secure U.S. Department of Education environment. Table A provides a list of committee members and their affiliations. This report summarizes the activities and results of the Mid-Atlantic Regional Advisory Committee (RAC), 1 of 10 RACs established under the Educational Technical Assistance Act of 2002 (20 U.S.C. § 9601 et seq.). The RACs were formed to identify the region’s most critical educational needs and develop recommendations for technical assistance to meet those needs. The technical assistance provided to state education agencies (SEAs) aims to build capacity for supporting local education agencies (LEAs or districts) and schools, especially low-performing districts and schools; improving educational outcomes for all students; closing achievement gaps; and improving the quality of instruction. The report represents the work of the Mid-Atlantic RAC, which includes Delaware, Maryland, New Jersey, Pennsylvania, and the District of Columbia. Committee members convened three times and reached out to their respective constituencies between July 19, 2016, and August 31, 2016. Members of the Mid-Atlantic RAC represented a variety of stakeholders, including local educational agencies (LEAs), state education agencies (SEA), education associations, and boards of education. The members collaborated, communicated, and shared resources using Communities360⁰, an interactive online platform hosted within the larger GRADS360⁰ system housed within the secure U.S. Department of Education environment. Table A provides a list of committee members and their affiliations. Two additional individuals, one from Maryland and one from New Jersey, were invited to participate but declined due to conflicts of interest. An additional superintendent from Pennsylvania originally accepted the invitation, but later removed herself from the committee.